If you’re on a long haul international connecting flight on Etihad, you will very likely end up connecting through the Abu Dhabi International Airport. 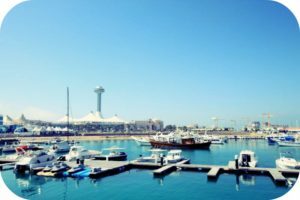 It is located roughly 30 kilometres from the city centre and makes the city a quick destination for those who are stuck on long layovers; the airport also makes it possible to let people get a taste of the Arab culture between flights. There are plenty of things you can do if you have more than four hours to spare. 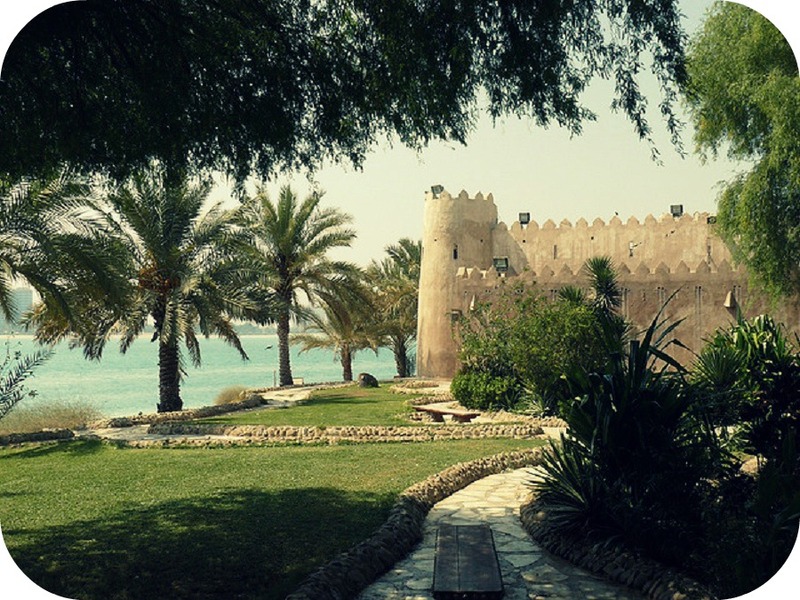 From the oasis city of Al Ain to Abu Dhabi city’s famous corniche and the massive dunes of the western region’s quarter desert in Al Gharbia, adventure, culture and history are an intricate part of this emirate. Experience the architectural brilliance of the Sheikh Zayed Grand Mosque, enjoy the peace and tranquillity of a stroll through the cooling oasis of Al Ain, learn the ancient sport of falconry, experience an adrenaline rush on the world’s fastest roller-coaster, marvel at the geography of an emirate dotted with ancient forts and historic sites, several of which have been listed as official UNESCO World Heritage Sites. 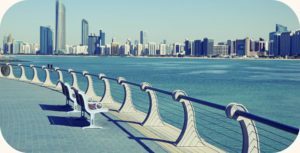 And whether you’re struck at the ever-changing marvellous views of Abu Dhabi while experiencing this emirate by air, sea or land, or are experiencing the genuine authenticity of Arabia while relaxing under the stars on a desert safari, playing golf on one of their championship-standard courses, or spending a fun day – and money – in one of their luxurious malls, you’ll realize that Abu Dhabi is a genuine leisure that will convince you to return over and over again for more than just a stopover. This majestic mosque is the most imposing religious and national landmark in Abu Dhabi to date. 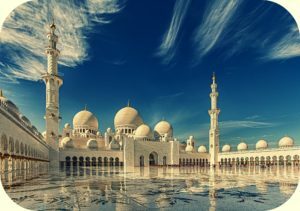 It is, arguably, a big treasure for the contemporary UAE society, and one of the most beautiful structures in the world. This architectural monument is one the world’s largest mosques, having the capacity to hold an astonishing 40,000 worshippers. Featuring 1,000 columns, 82 domes, 24-carat gold-covered chandeliers and the largest handmade carpet in the world. The prayer hall is dominated by one of the world’s largest chandeliers, each of which weighs 12 tonnes and is 10 metres in diameter and 15 metres in height. The mosque’s 1st ceremony was the funeral of its namesake, Sheikh Zayed, who is buried at the site. It provides a first-hand look at the religious traditions of the area. It can be easily accessed by taxi from the airport. Don’t forget your camera and capture the traditional detailing on the stunning white marble architecture. Remember to dress modestly and head scarves are available for use at the mosque for women to cover their hair. Pay attention to the areas and locations that are permissible for men, women and tourists to avoid offence. The 1st Ferrari theme park is located on Yas Island, Abu Dhabi, UAE, with over 20 attractions. It is the largest indoor amusement park featuring Formula Rossa, the world’s fastest roller coaster. Who wouldn’t want to try that? 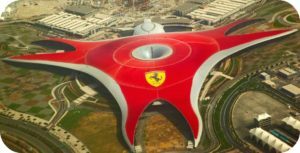 At Ferrari World Abu Dhabi, the fun never stops, it’s open 365 days a year and offers a unique experience for visitors of every age in a refreshing climate-controlled environment. 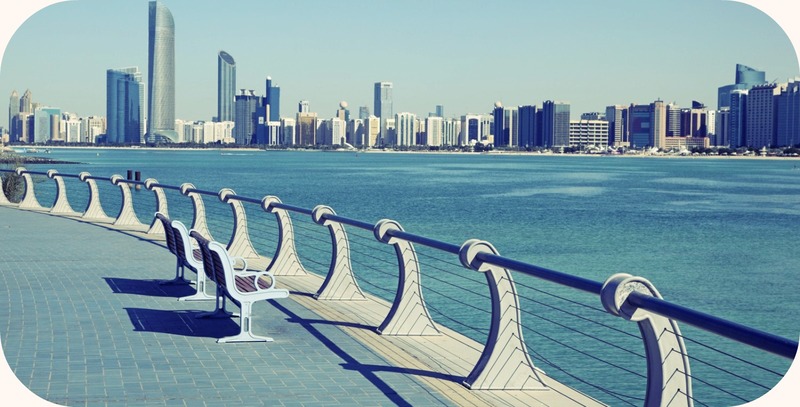 The Corniche is a stretch of 6 kms along the coast of Abu Dhabi from the Hilton Hotel to the Sheraton Hotel. Along with gardens, fountain, refreshments and various activities from wakeboarding to volley ball. It is an ideal place to get a feel and sense of the city, particularly if you want to stretch your legs between flights. Walk along outside and grab a bite to eat at one of the hotels that lines this beautiful strip. You can also take a quick dip or just indulge in a bit of beach bumming. Dress modestly though to avoid unwanted attention and carry sunscreen for the sun, which is particularly strong in the summer. Yas Marina Circuit is considered to be one of the most technologically advanced Formula 1 circuits in the world. Being a training ground and home for motorsports in the Middle East, it offers a number of motorsport activities including driving race cars, karting and passenger experiences. Their collection of cars include Aston Martins and Lamborghinis. ‘The Souk’ is a first-of-its-kind unique marketplace in Abu Dhabi. This is a contemporary adaptation of a typical Arabian market, with water taxis (abras) ferrying you round the waterside complex via meandering man-made canals. This two-level souk is a fusion in architecture built to showcase Arabian and Venetian architecture and reflect traditional Arab hospitality and generosity. 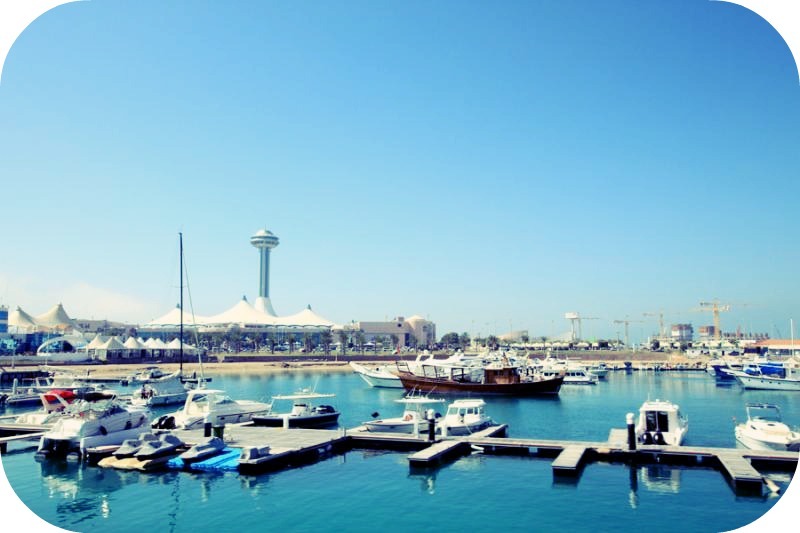 The Marina Mall Tower offers incredible and breath-taking views over the city and over the Corniche. At the base of the tower is a skating rink with ski slopes, and the mall has over 350 stores for all your shopping needs. If shopping is your thing, this is the place to be. There are numerous restaurants to choose from, including several serving local foods. Heritage Village is a museum that shows the history of the area. With mud-brick houses, gardens, ancient tombs and camel rides, you can see how people used to live in the nomadic cultures. It gives you a great perspective on what Abu Dhabi used to be and allows you to partake in its history and culture. 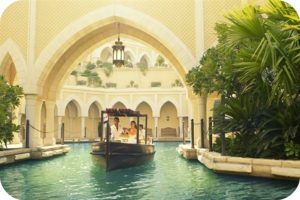 This entry was posted in Adventures, Latest Articles and tagged Ferrari World, Heritage Village, Marina Mall Tower, Sheikh Zayed Grand Mosque, Souk Qaryat Al Bery, The Corniche, Travel, Yas Marina Circuit. Bookmark the permalink. Welcome to my city of Abu Dhabi tiny lady will you be staying awhile? 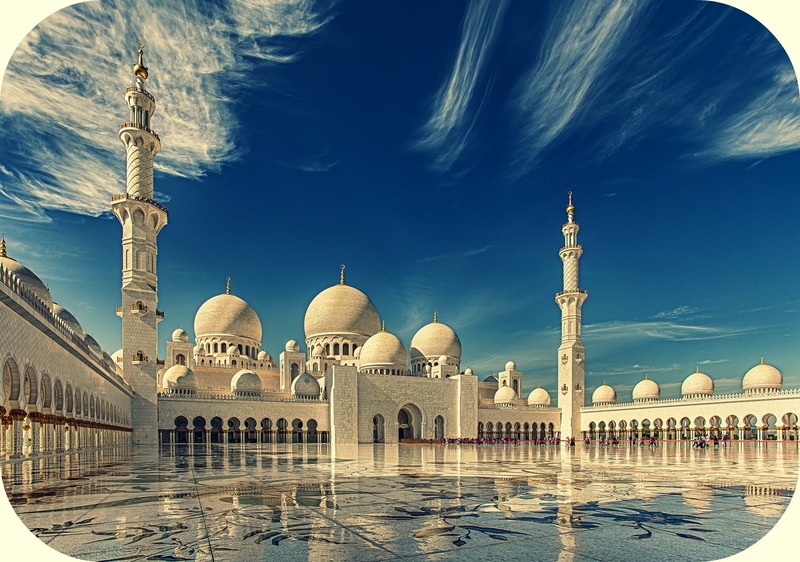 Isnt Sheikh Zayed Grand Mosque absolutely breathtaking?